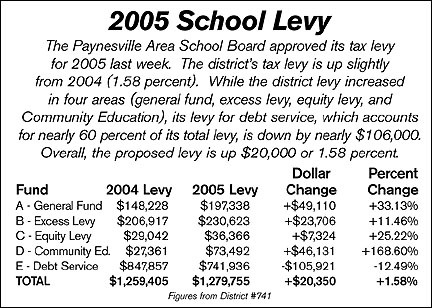 The 2005 property tax levy for the Paynesville Area School District (#741) increased slightly from 2004. The district will levy $1.279 million in 2005, up $20,000 from 2004, when the district levied $1.259 million. Overall, the district levy increased by 1.58 percent. The levy - identical to the district's proposed levy - was approved by the school board on Tuesday, Dec. 21.. The district levy increased in most areas (general fund, excess levy, equity levy, and Community Education), totaling $126,271. But these increases were mostly offset by a decrease in the levy for debt service (down $105,921), yielding a net increase in the levy of $20,350.. The general fund levy (see Line A in the chart) is up $49,110 in 2005, with the district planning to levy $92,800 for health and safety projects, up $44,000 from 2004. The general fund levy also includes levies for capital expenditures ($45,600), safe schools ($33,600), and vocational programs ($23,900).. The levy for the district's excess levy and its equity aid from the state (see Lines B and C in the chart) is up $31,000 in 2005.. The district's levy for Community Education (see Line D in the chart) is up $46,100 from 2004. This levy, however, was down in 2004 because the state unalloted $30,000 from the Community Education balance. This was done by forcing district's to levy less for Community Education in 2004. The levy for Community Education ($73,500) in 2005 is up slightly from 2003 ($62,900).. The levy for debt service in 2005, on the other hand, is down $105,900 (see Line D in the chart). These funds are dedicated to paying the bonds from district building projects and the decrease is due to a healthy balance in this district fund.. Overall, the district levy for 2005 is $1.279 million, up slightly from 2004 ($1.259 million) and down from 2003 ($1.405 million), when the current excess levy took effect. . The levy is up from 2002 ($0.964 million), the year after the state started paying for more of the basic education aid, thereby reducing property taxes, and the levy is down from 2001 ($2.228 million), before the state reduced property tax burdens by assuming more funding for education..